YOU GUYS. I am so damn excited for this DIY. Have you ever made something and been like 'I understand how this is supposed to work, but I really don't think it's going to work that well.' This DIY project surprised the HECK out of me with how much the end product FIZZED. I didn't think it was going to be THAT FIZZY for an at home bath bomb!! So let's get into it. Start by measuring out your baking soda & citric acid. 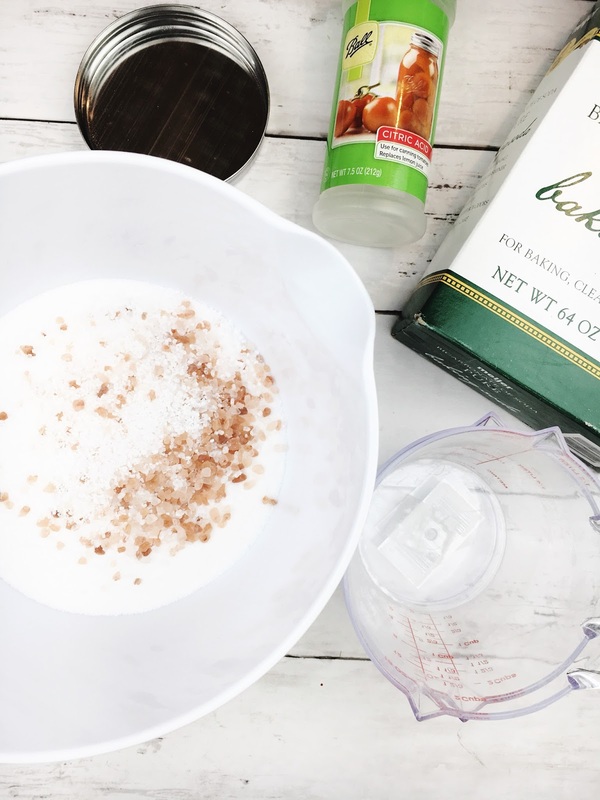 You'll want to wear a mask during the mixing part of this - the baking soda will go everywhere and you want to protect those lungs. 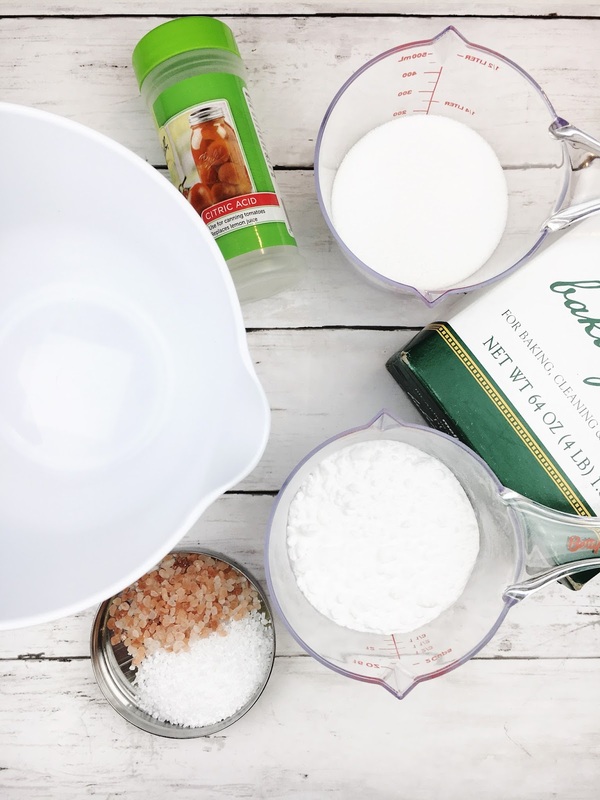 You'll need 1 cup baking soda and 1 cup citric acid. I stocked up on citric acid when our Meijer started carrying canning supplies but you should be able to find this in your grocery store wherever they have their canning supplies, or you can purchase it online. Add up to 1/4 of the epsom and Himalayan salts - I suggest adding only 1 tbsp of epsom and 1 tbsp of Himalayan. 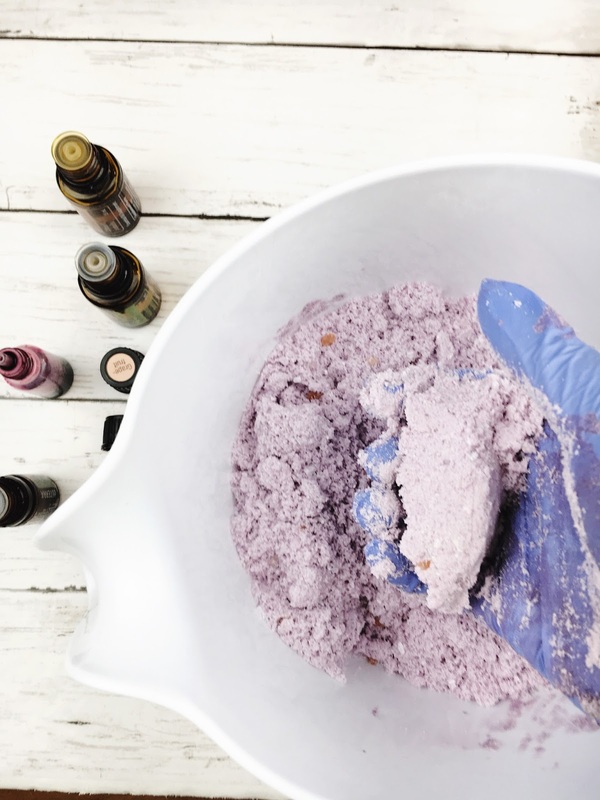 If you add too much it will affect the way the bath bomb holds together. 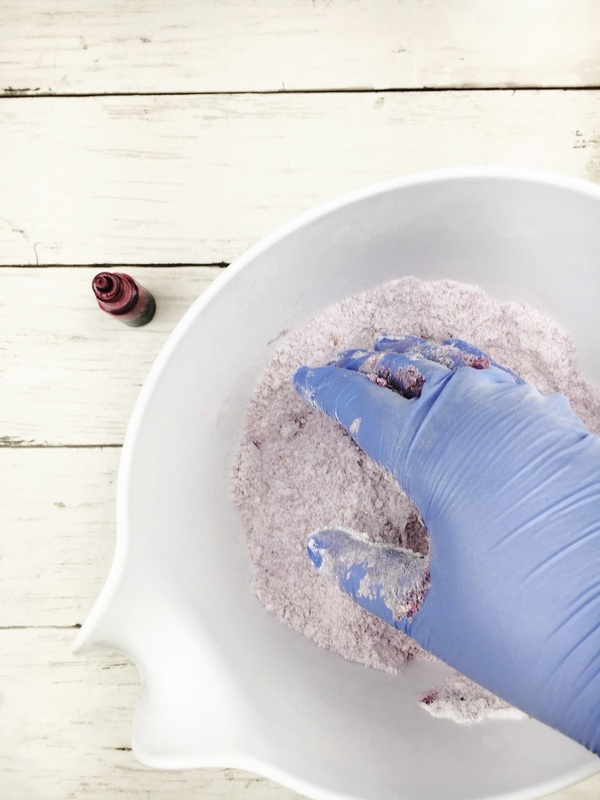 Use your gloved hands to mix the dry ingredients together. This is where the baking soda will really go flying so please, please use a mask! Next begin to add your colorant. Add a small amount at a time. If you're using water soluble colorant you may notice a bit of fizzing. I wasn't able to take a photograph because when that happens you need to work fast to blend in the colorant. Keep adding and blending, adding and blending until the mixture is the color you'd like...but don't add too much that the mixture is starting to stick together. 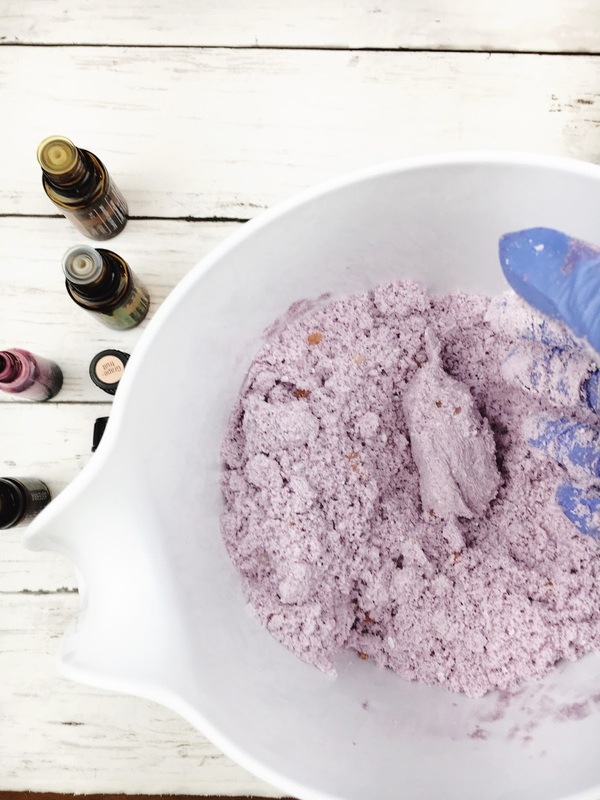 Once the you achieve the color you'd like, add in your essential oils. I added in 10-12 drops Grapefruit, 10-12 drops Melaleuca, and 5-7 drops of Douglas Fir. Blend with your hands until it is well incorporated. I want to make a note here on the quality and purity of essential oils. I recommend using doTERRA essential oils as they go through a rigorous test to ensure purity and potency. If an oil doesn't meet the Certified Therapeutic Grade standard set by doTERRA, the oil isn't used for production. 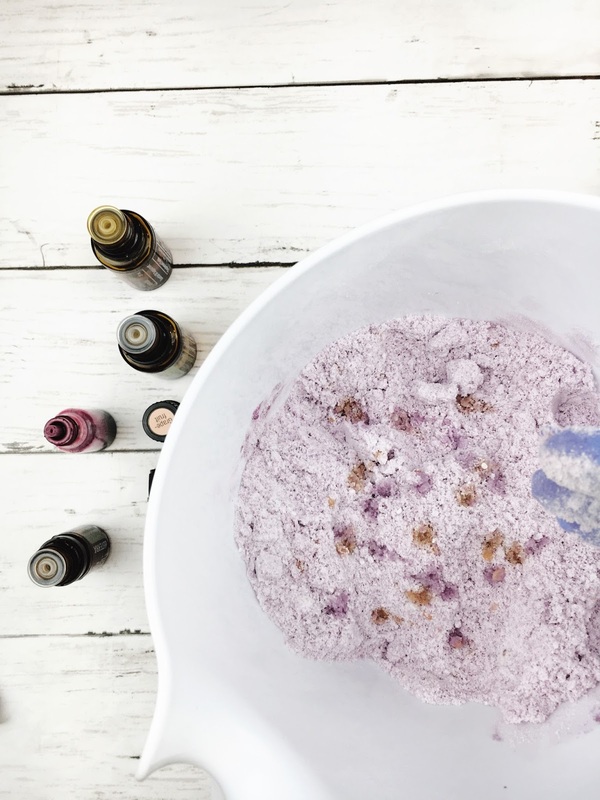 Essential oils you may find on your grocery store shelves can have additives that decrease the purity and the quality of the oils. They may have synthetic proprieties even if the label says that the oil is a pure oil! It is at this point that you want to check the consistency. You'll want it to stick together like wet sand. If you've ever played with that magic sand stuff, that's the consistency you're looking for. The product needs to stick together when you squeeze it and stay together when you lightly drop it in the bowl. Once its there, and if you need it, add it a couple drops of the fractionated coconut oil. This will one help to release these guys from the mold and condition the water just a bit...since you won't need a whole lot. Now it's time to pack the molds! You can use a bath bomb mold but these plastic ornaments are perfect for this. Be sure to pack each half tightly. 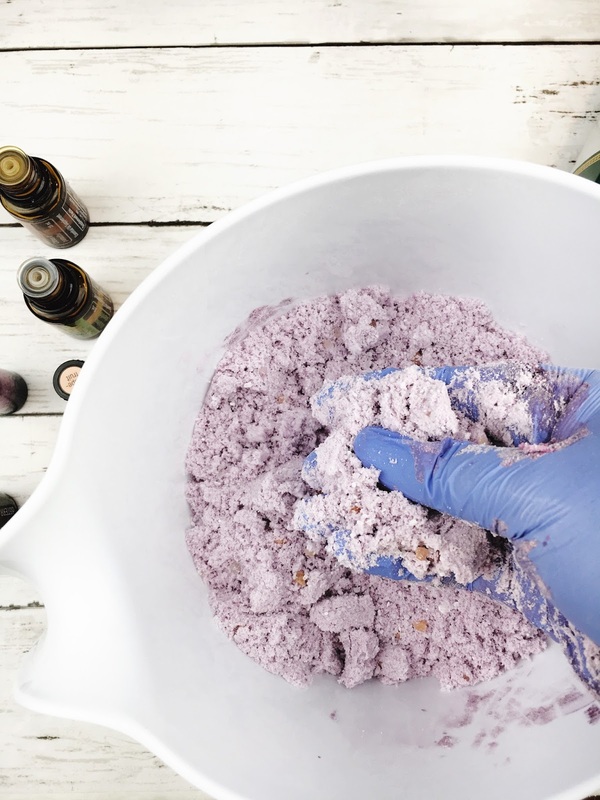 Use the palm of your hand to compress the mixture into the mold and use your fingers to press the outer edges down. Make sure each mold is packed full then over pack (just a smidge) one half of the mold. Working over your bowl, press the two halves together letting the excess mixture fall into your bowl. Squish and rotate the two halves until they meet and close as well as they can. Then repeat for the second mold. If you pack these guys tight enough you can remove them from the mold with in an hour and let them harden up out on the table. 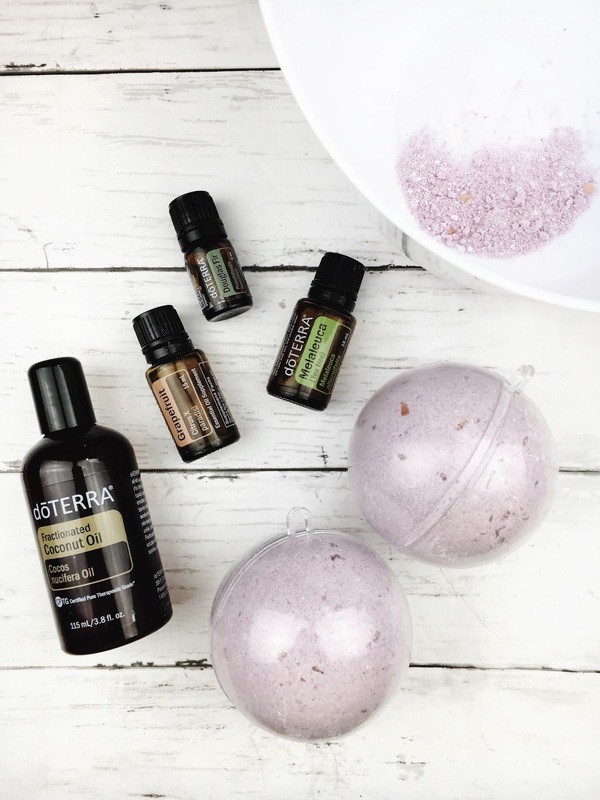 Essential oils can really affect your mood and your emotional wellness since they interact directly with the limbic system of the brain - the system responsible for memory and emotion. Inhaling an the aroma of an essential oil passes the scent over the olfactory system - the system responsible for processing smell - and interacts with the limbic system. Since scent is so directly related to our experiences, memories, and emotions, inhaling any scent sends a rush of feelings and memories into our awareness. Working with essential oils can help you to align your thoughts and your mood depending on what mood you're looking to change or enhance. 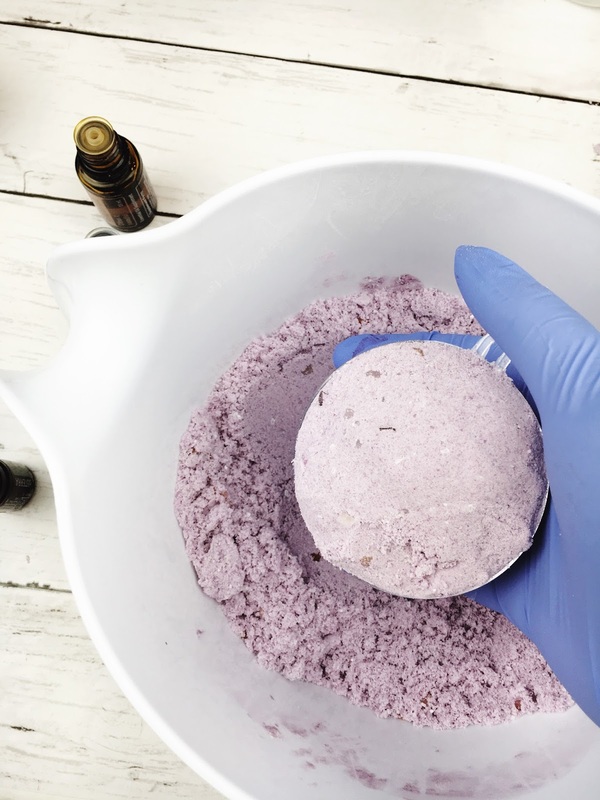 This recipe makes two bath bombs if you're using the ornament as a mold. I found some silicone molds at Micheal's and some on Amazon that I can't wait to try out. This scent is great for relaxing but if you wanna make something perfect for when you're sick try using On Guard, Oregano, Lemon, and Melaleuca. I honestly can't wait to try this one. 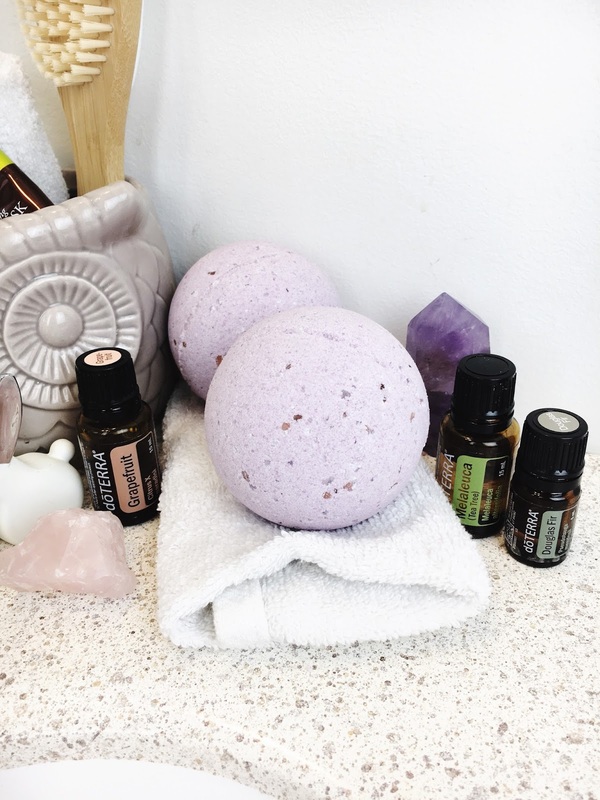 Taking a bath can be an active, restorative, and supportive act of self care...especially when you're adding essential oils to support your relaxation and rejuvenation. On February 12th I'll be hosting a free online webinar on using essential oils for self care. 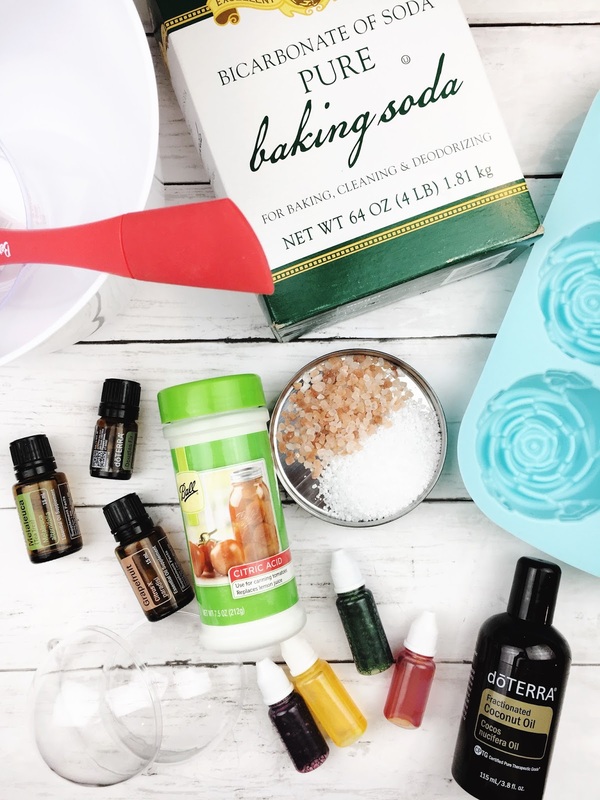 We'll talk about what an essential oil is, how essential oils stimulate and align emotions, the 3 pillars of self care, and how to create your own active, restorative, and supportive self care rituals. Click here to find the Facebook event where you can register. Once you register you'll receive a FREE self care planner! 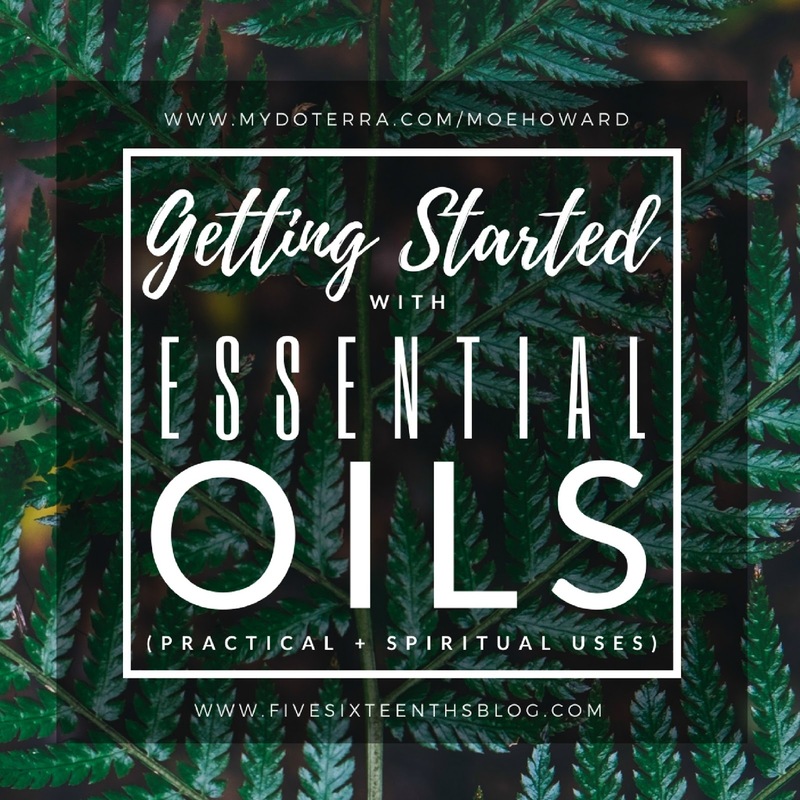 Essential oils have become a wonderful part of both my physical and emotional wellness in the past year and I want to share their benefits with you! So I hope to see you at the webinar!